Extra- Small 45" When Stored. EXTRA LARGE 54" when in Use. 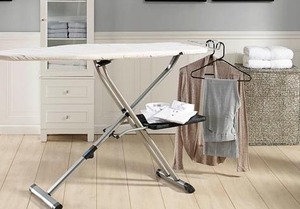 The IB9100 Pro Compact Ironing Board is the ultimate in ironing convenience. Ulta-secure stability with extra-padding for superior ironing. Unique folding design compresses 54” ironing surface down to 45” for easy, compact storage. Made in Portugal. The innovative Rowenta Pro-compact is the most compact ironing board when folded for easy transport and perfect storage. 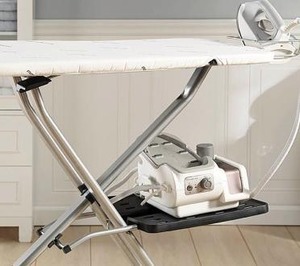 Pro-compact provides perfect stability, and efficient ironing with an extra large ironing surface when open to iron faster large pieces of cloth. The thick branded cotton cover offers perfect ironing results without any prints left on the fabric. This is an easy-to-use, easy-to-store, and easy-to-transport ergonomic product. 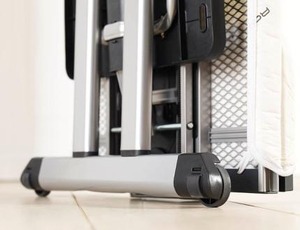 To ensure long-lasting ironing board, metallic mesh platforms are treated against corrosion and robust materials provide durable high quality boards. The large ironing surface permits. Rowenta ironing boards range offers a 5 year- warranty. 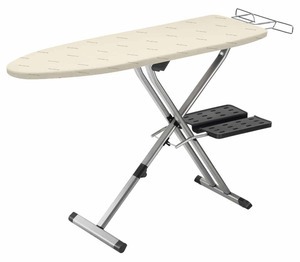 Rowenta IB9100U1 Pro Compact Folding Ironing Board Review! Fold Down to only 45"